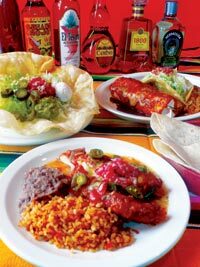 For those who can’t live without those tacos, burritos, fajitas and other Tex-Mex specialties, Tex-Mex Restaurant Mike’s has another solution. 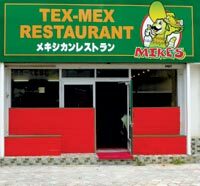 A new branch of the popular eatery is opening Friday just outside Kadena Air Base, promising all the fresh tastes already at the Tex-Mex Restaurant Mike’s in Chatan Town. Everything is fresh at Mike’s, with no canned or frozen foods used in the entrée preparations. From quesadillas and taco salads to tacos, burritos and fajitas, the palate warming creations will give the feeling of being in Mexico. The atmosphere, décor and a smiling staff add to the ambience, too, making lunch and dinner visits a pleasant experience. Mike’s in Okinawa City has 28 seats, making it ‘just right’ for that small party. There’s even a party plan, where guests can select five items, plus free drinks for two hours, at a starting price of ¥3,000 per person on Sunday through Thursday, and from ¥4,000 on Fridays and Saturdays. To get to the new Mike’s coming out of Gate 2, turn left at the third traffic light (at the corner where Richie Rich clothing store is, orange signboard). Then past the first traffic light on that street, on the left. Mike’s serves lunch from 11 a.m. ~ 2 p.m., while dinners are offered 5 p.m. ~ 10 p.m. Sunday ~ Thursday, and 5 p.m. ~ midnight Fridays and Saturdays.